This edifice is the best preserved hall of Diocletian’s Bath converted into a church by Michelangelo in the year 1563. With the transformation of this building the great artist, aged 88, accomplished the last work of his long artistic career. Official Rome Guide, Rome walking city Tours. The round hall we see on entering does not form part of the church of Michelangelo, but was another hall of the Baths (probably a calidarium) added by Vanvitelli, in 1740 when he altered the church to the present form. The artist adapted this circular hall as a vestibule, added the tribune and choir in the other side, thus converting the large central hall which was the nave in Michelangelo’s church, into a transept. On each side of the entrance are the tombs of Salvator Rosa and Carlo Maratta, two famous painter’s of the 17th century. Against the pier , on the right, is the beautiful statue of St. Bruno the founder of the Carthusian order, by Houdon, so much admired by Pope Clement XIV, who used to say: “He would speak if the rules of his order would allow him to do so ”. A little further, we can enjoy the view of the large vaulted hall of the Baths of Diocletian, perfectly preserved and the only hall in Rome which gives us an idea of the magnificence of the Roman baths as it was left nearly intact by Michelangelo. Guide of Rome. The only modification in this hall is the raising up of the floor and of the bases of the columns, the originals being buried seven feet lower down. The bases we see now are modern and made in two pieces put around the shaft. Of the sixteen large columns which ornament the church, only the eight in the transept are of the original granite, the others were built, by Vanvitelli, in bricks and stucco in imitation of the old ones. This hall is a gallery of large pictures, most of them were removed here from the church of St Peter, when they were replaced there by mosaic copies. Official Rome Guide, Rome walking city Tours. The bronze rosettes visible on the roof, fixed in each compartment of the vault, are original and probably served for supporting hanging lamps. These audacious and enormous vaults, springing up from very high walls and pilasters, are an example of the skill and perfection of the Roman thermal architecture and of the strength of the Roman cement. They are an absolutely Roman creation in which the Romans show their great superiority on the Greeks. According to an ancient Christian tradition, based on the authority of the martyrologists, the baths were built by the forced labour of forty thousand Christians, who afterwards were martyred. Most probably we are indebted to this traditions for preservation of this beautiful edifice. 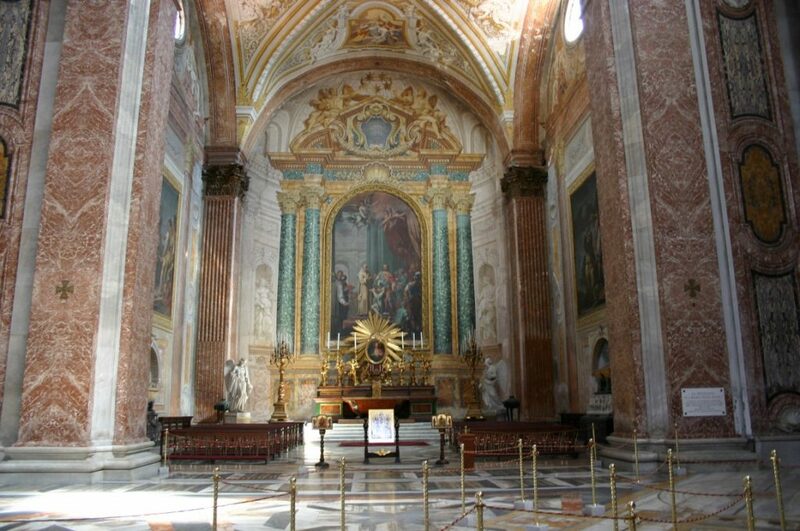 On the walls, on each side of the high altar, are frescoes removed also from the church of St. Peter. At the end of the tribune, is a beautiful Madonna surrounded by a glory of angels by Perugino; on the left, the tomb of Pope Pius IV of the Medici family who had the building transformed into a church. Professional, expert, official tour guides of Rome. The meridian line we see on the floor was traced by astronomer Bianchini in the year 1701 for fixing the date of the celebration of Easter which sometimes had been erroneously calculated. In the centre of the coat of arms of Pope Clements XI, high up in the right transept, ther is a hole through which the ray of the Sun passes, striking on the meridian line traced underneath. On each side of the line are signs of the constellations, designed by Carlo Maratta. In the right transept: the tomb of General Diaz the commander in chief of the Italian army during the war 1915-1918. Guide of Rome. Turning to the right beyond the Hotel St Regis in Rome we see the fountain of Moses.